obviously not all, but here are some faves. many for friends, family, and wee babes. and a bunch for patterns i wrote and much out of handspun. what is your favorite knit(s) from 2009? My favorite knit from 2009 would have to be the maple leaf cardigan I knit to wear at Rhinebeck. I’m working on a pattern for it now, and wear it several times a week, and am still just so proud of it! that is a beautiful cardigan. i love garments that i get that much wear out of! This is such an awesome set of knits :) Your reflection hats are one of my faves, I love that pattern. Happy 2010, I can’t wait to see what you come up with this year!! happy new year to you too! to much happy knitting. That’s a good question. I’m not sure I knitted anything too exciting. There are a few pairs of mittens that made me happy. I was kinda lame in the fiber department in 2009. Your collage is lovely! All the colors just make a really great looking group. i guess you’ll have to be sure and knit something spectacular this year! What a beautiful collection! I was just looking through my Flickr and thinking about doing a favorite post as well. you should! i’d love to see it. thanks :) it is certainly hard to give away your favorite knits! but i bet she appreciated it. gorgeous knits — 09 was really all about handspun for me, so my favorites are really everything that i was able to make out of stuff i spun myself. my snail hat, spun from your cvm, is way up there on the list! 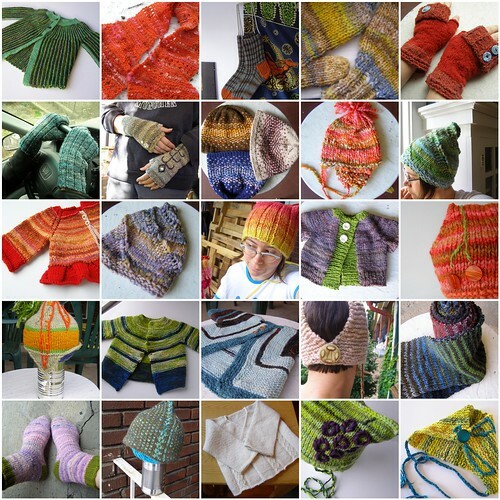 you really did some lovely spinning and knitting this year! it has been really fun watching you get into spinning. I think my favorite projects of 2009 where all the cute little birds I made both ornaments and not. i loved the birds! so fun. The Button-Back Mitts, which are so chic and functional. I also love how round the tops of your mittens are, rather than that offputting rhomboid shape I see so often. Yours are the mittens of my childhood! thanks :) and yes! i’m pro round top mitts.